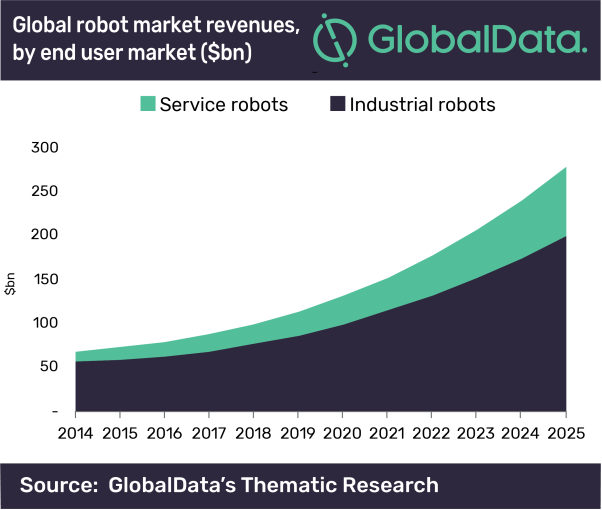 Within the next six years, the global marketplace for robotics will almost triple, accelerating from $98bn in 2018 to surpass $275bn by 2025, according to GlobalData, a leading data and analytics company. The company’s latest Technology Thematic Research report, ‘Robotics’, reveals that the robotics industry will grow at a compound annual growth rate (CAGR) of 16% between 2018 and 2025, with annual growth peaking at 17% in 2022. The next five years will see rapid growth in cloud-based robot services for armies of installed robots and for robots hired on an as-needed basis, especially by small and medium-sized enterprises, triggering new demand drivers. Despite concern over the future of human jobs and identity, momentum is unlikely to stall for at least the next five years as organizations globally seek boosts to sagging productivity in manufacturing and services across both the public and private sectors. According to Gary Barnett, Chief Analyst for Technology Thematic Research at GlobalData, “Growth is being driven by robots becoming progressively cheaper, smarter, more flexible and easier to train. That in turn is making it easier for robots to infiltrate new industries and drive new use cases.